Goucher Athenaeum, Goucher College, Baltimore. Berkeley Law Library, University of California. William Oxley Thompson Memorial Library, Ohio State University, Columbus. South Mountain Community Library, Phoenix. Lemieux Library and McGoldrick Learning Commons, Seattle University. Science and Engineering Library, Columbia University, New York. Consider (a) appropriateness and quality of materials; (b) connections between interior and exterior spaces; (c) durability of building finishes and furnishings; (d) appropriateness of materials used given local circumstances; and (e) responses by stakeholders, community or beyond including recognition, additional funding, and/or symbolic significance. Consider (a) how stakeholders and staff input shaped the design; (b) any campus or neighborhood improvements such as pedestrian access; (c) any incorporation of multi-functional uses; (d) any creative solutions to local constraints; and (e) an appropriate physical setting. With regard to (a) site selection and development; (b) water efficiency; (c) energy use; (d) materials and resources used; (e) indoor environmental quality; and (f) ongoing education, outreach and operations. 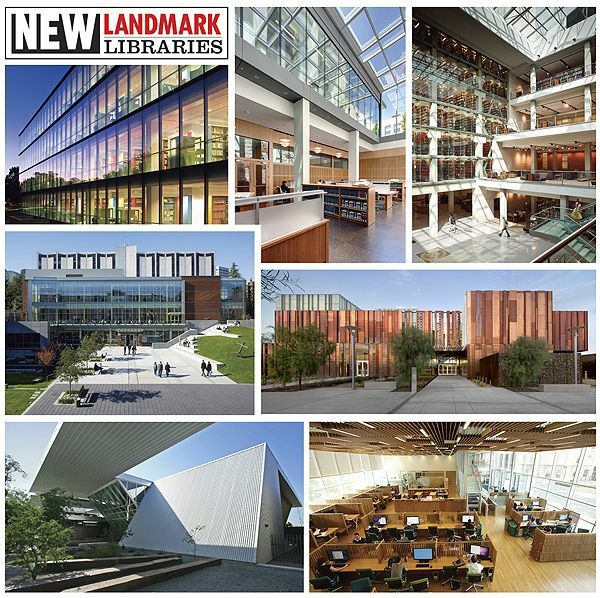 A new landmark library maximizes functionality in the delivery of library services. What design elements improve the service delivery, experience, and accessibility for students, faculty, community and staff? Landmark libraries respond to current and anticipated demographic, cultural and technological changes in innovative ways. Does the building test and prove the viability of new knowledge and assumptions? Judges looked for evidence of positive initial impressions, a “wow” factor that delights visitors and any local, state, or national recognition and how does this relate to the design? Is the initial impression and “wow” factor long lasting and why. This entry was posted in 空間設計、趨勢 and tagged 公共圖書館、地標、大學圖書館、建築 by ted. Bookmark the permalink.